Bacteria are a large group of unicellular, prokaryote, microorganisms. 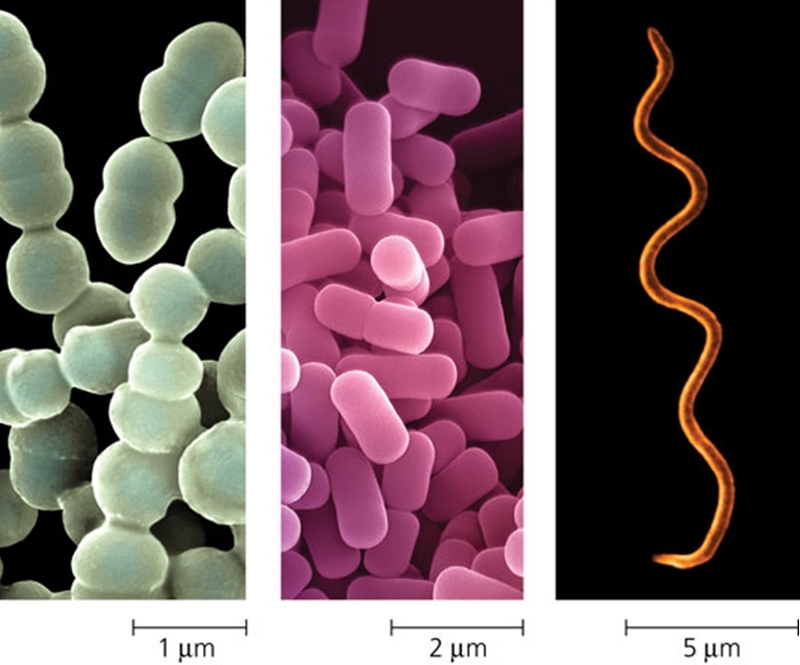 Bacteria are typically a few micrometers in length and have a wide range of shapes, ranging from spheres to rods and spirals (Figure 1, Figure 2). Bacteria are ubiquitous in every habitat on Earth, growing in soil, acidic hot springs, radioactive waste, water, and deep in the Earth's crust, as well as in organic matter and the live bodies of plants and animals. There are typically 40 million bacterial cells in a gram of soil and a million bacterial cells in a millilitre of fresh water; in all, there are approximately five nonillion (5×1030) bacteria on Earth, forming much of the world's biomass. Figure 1. Bacteria come in a variety of cell shapes. Figure 2. Most bacteria have diameters in the range of 1 µm (micrometre) to 5 µm. From left to right: Spherical (cocci) bacteria, rod-shaped (bacilli) bacteria, Spiral bacteria. Bacteria are vital in recycling nutrients, with many steps in nutrient cycles depending on these organisms, such as the fixation of nitrogen from the atmosphere and putrefaction. However, most bacteria have not been characterized, and only about half of the phyla of bacteria have species that can be grown in the laboratory. The study of bacteria is known as bacteriology, a branch of microbiology. There are approximately ten times as many bacterial cells in the human flora of bacteria as there are human cells in the body, with large numbers of bacteria on the skin and as gut flora. The vast majority of the bacteria in the body are rendered harmless by the protective effects of the immune system, and a few are beneficial. The bacteria being profiled in this section are those that are pathogenic to humans by causing infectious diseases (Figure 3). Figure 3. Areas of the body that are susceptible to various types of bacteria. Click to enlarge. 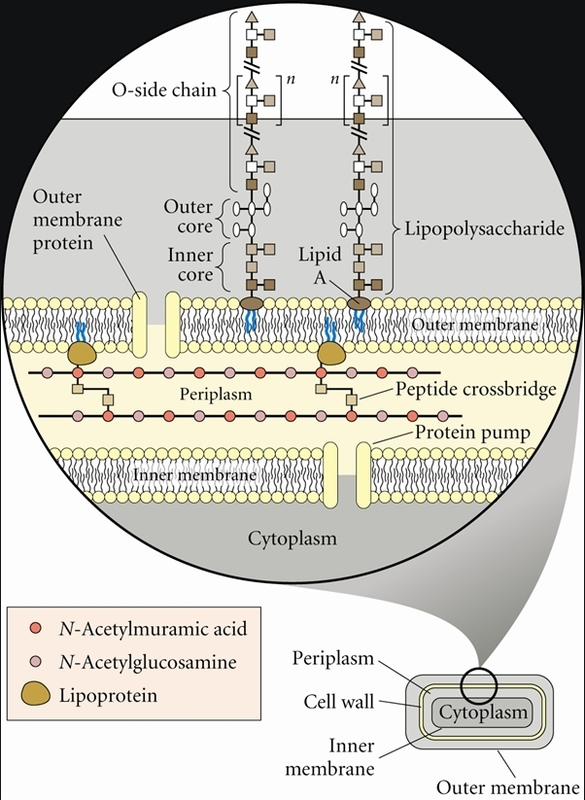 Gram-negative bacteria have a relatively thin cell wall consisting of a few layers of peptidoglycan surrounded by a second lipid membrane containing lipopolysaccharides and lipoproteins (Figure 4). These bacteria do not retain crystal violet dye in the Gram staining protocol due to their lipopolysaccharide outer layer. In a Gram stain test, a counterstain (commonly safranin) is added after the crystal violet, coloring all Gram-negative bacteria with a red or pink color. On the other hand, Gram-positive bacteria will retain the crystal violet dye when washed in a decolorizing solution because they do not have an outer membrane; rather, they have a thickened peptidoglycan layer. Figure 5 illustrates the difference in antigens associated with the two different types of bacteria. Figure 4. Outer surface of a Gram-negative bacterium: Note the LPS in the Outer membrane. Figure 5. Antigens involved in host responses to bacteria: Gram-positive and Gram-negative bacteria. Click to enlarge. 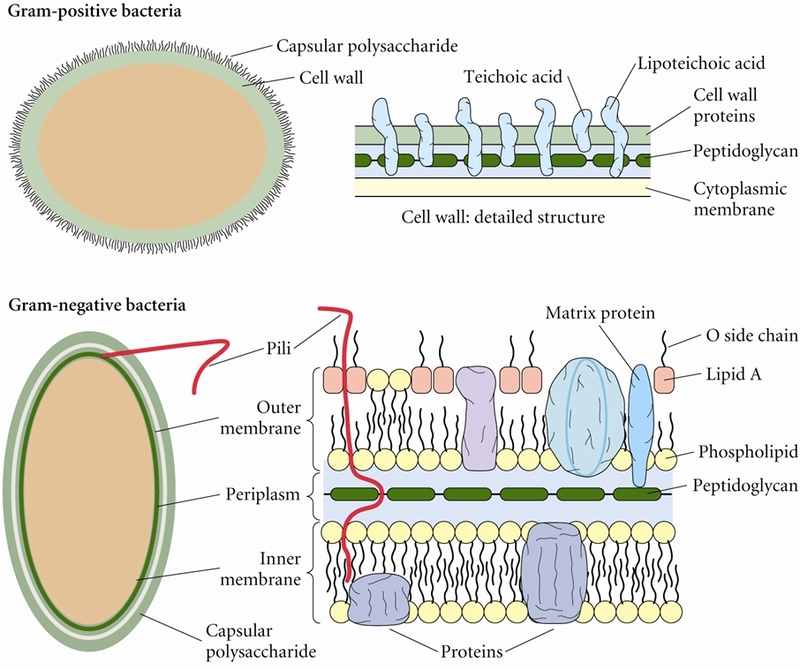 The pathogenic capability of Gram-negative bacteria is often associated with certain components of Gram-negative cell walls, in particular the lipopolysaccharide (also known as LPS or endotoxin) layer (Figure 4). In humans, LPS can trigger both an innate and adaptive immune response characterized by cytokine production and immune system activation. For instance, LPS can trigger the complement cascade which is part of the innate immune response and also bind to toll-like receptors (TLR-4) on B lymphocytes to trigger an adaptive, humoral response without the need of T-helper cells; thus, LPS is known as a T-independent antigen. Inflammation is a common result of cytokine production, which can also produce host toxicity. Protection against Gram-negative bacterial infection: Antibodies produced by B lymphocytes such as immunoglobulin M (IgM) are effective against extracellular bacterial pathogens. Antibodies can defend against Gram-negative bacteria by attaching to their surface and activating complement. The activated complement cascade induces the formation of membrane attack complex (MAC), which produces holes or pores in the outer membrane. The antibody that is attached to the bacteria can also attach to phagocytes such as macrophages through Fc receptors on the phagocyte - a process referred to as opsonization (Figure 6). This promotes phagocytosis and bacterial elimination. In addition, complement bound to bacteria can attach to phagocytes through complement receptors (CR), which promotes phagocytosis (Figure 6). Figure 6. 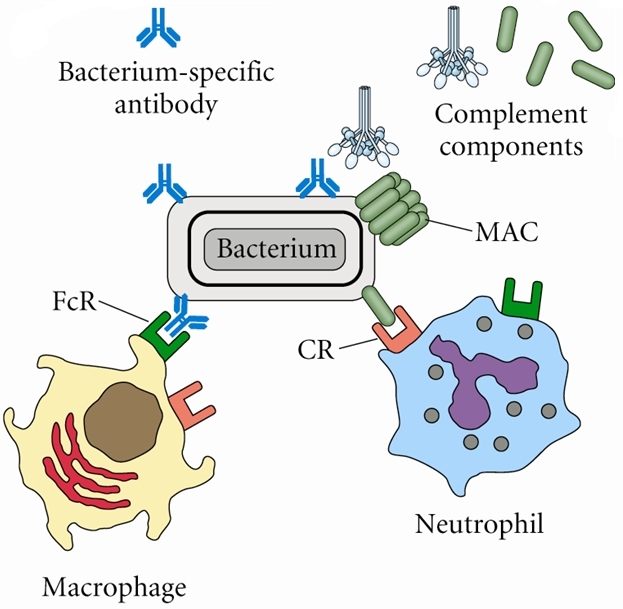 Examples of antibody-mediated mechanisms against Gram-negative bacterial infections. 9. Lipoproteins are attached to the polysaccharide backbone. An outer membrane consisting of a lipid bilayer, similar in some respects to the plasma membrane, that contains protein molecules and (on its inner aspect) lipoproteins linked to the peptidoglycan. Other proteins form transmembrane water-filled channels, termed porins, through which hydrophilic antibiotics can move freely. Complex polysaccharides forming important components of the outer surface. These differ between strains of bacteria and are the main determinants of the antigenicity. The complex polysaccharides constitute the source of endotoxin, which, in vivo, trigger various aspects of the inflammatory reaction by activating complement, causing fever.